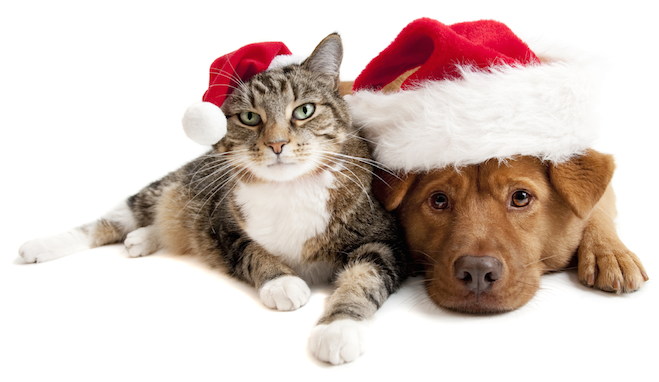 ‘Tis the season for holiday parties, and many pet lovers jump at the opportunity to include their four-legged friends in the festivities. Pet holiday parties may range from the simply elegant to the simply silly, but they all have one thing in common – a doggone good time. Attire: One of the best ways to set the stage for a party is to ask guests to sport a festive look, and pets are no exception. For a classy party, use your invitation to ask your guests to dress up and remind them to bring their furry friends on their favorite fancy leash. You can find an array of dressy options at PetSmart, including bowties, sparkle dresses and the Santa Cat Cape, all will surely dress up the occasion. Or go the other direction with a fun ugly sweater party. Invite your friends to dress the part and bring their pets in their silliest attire. The Bret Michaels PetsRock line of ugly sweaters – some even light up – are the perfect complement to your own gaudy attire. Mealtime: Consider setting up a treat buffet for your four-legged friends. Fill large clear glass containers with different varieties of colorful treats. Manners: Don’t expect your four-legged friends to share. Purchase a festive dog bowl for each guest, such as the Martha Stewart Pets Santa ceramic bowl from PetSmart, and fill each with water. Then keep them for next year’s holiday party, or give them away as party favors at the end of the event. Music: Set the tone with holiday tunes, or go one step further with a little bit of research into the names and breeds of the pets loved by the composers or singers. Make a playlist of your favorites and type it up for your guests. Decor: Snap a Polaroid photo of each of your guests in their festive attire as they arrive. Hang a clothesline made of ribbons near the entrance and clip the photos up with clothespins as they print for instant personalized decor that your guests will love. Gifts: Don’t forget the party favors. Consider a small gift for each family to take home with a bone-shaped card attached that reads “Happy Howlidays!” Another option is a small faux tree decorated with bright dog toys and bones. (Be sure to use a faux tree; four-legged guests may be tempted to leave their mark on the real thing.) At the end of the event, you can ask your guests to choose a treat as their take-home favor. For more holiday ideas and tips, visit your local PetSmart or www.PetSmart.com/holiday.